Billionaire Mukesh Ambani today became the richest person in the world, surpassing American software czar Bill Gates, Mexican business tycoon Carlos Slim Helu and famous investment guru Warren Buffett, courtesy the bull run in the stock market. Following a strong share price rally on in his three group companies, India's most valued firm Reliance Industries, Reliance Petroleum and Reliance Industrial Infrastructure, the net worth of Mukesh Ambani rose to $63.2 billion (Rs 2,49,108 crore). In comparison, the net worth of both Gates and Slim is estimated to be slightly lower at around $62.29 billion each, with Slim leading among the two by a narrow margin. The five richest people in the world with their net worth 1. Mukesh Ambani ($63.2 billion) 2. Carlos Slim Helu ($62.2993 billion) 3. William (Bill) Gates ($62.29 billion) 4. Warren Buffett ($55.9 billion) 5. Lakshmi Mittal ($50.9 billion) Warren Buffett, earlier the third richest in the world, also dropped one position with a net worth of about $56 billion. Ambani's wealth of about Rs 2,49,000 crore includes about Rs 2,10,000 crore from RIL (50.98% stake), Rs 37,500 crore from RPL (37.5%) and Rs 2,100 crore from RIIL (46.23%). Slim's wealth has been calculated on the basis of his stake in companies like America Movil (30%), Carso Global (82%), Grupo Carso (75%), Inbursa (67%), IDEAL (30%) and Saks Inc (10%). According to information available with the US and Mexican stock exchanges where these companies are listed, Slim currently holds shares worth a total of $62.2993 billion, with more than half coming from Latin American mobile major America Movil. Slim is closely followed by Gates with a net worth of $62.29 billion currently. Earlier last month, US business magazine Forbes had named Gates as the richest American with a net worth of $59 billion, calculated as on August 30. The magazine had said that a movement of $2 in the share price for Microsoft, the world's biggest software maker, could "add or subtract $1 billion" from his wealth. Since August-end, Microsoft's share price has risen by $6.58 (based on yesterday's closing on Nasdaq at $35.03), which results into a gain of $3.29 billion in Gates' wealth based on Forbes assumption. Besides a stake in Microsoft, Gates' wealth also includes the commission and license fees earned by him and gains through his shares in an investment holding company that invests across the market. Gates is followed by Buffett at the fourth place in the league of the world's richest with a net worth of $55.9 billion through his holding in his investment vehicle Berkshire Hathaway and in other companies. At the end of August, Buffett's wealth stood at $52 billion, as per the Forbes magazine. Berkshire Hathaway's share price has gained by about 7.5% since then. 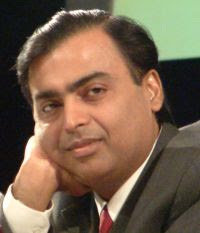 Earlier on September 26, Ambani had overtaken steel czar Lakshmi Mittal to become the richest Indian in the world. Mittal currently ranks as the fifth richest in the world with a net worth of $50.9 billion through his 44.79% stake in world's biggest steel maker ArcelorMittal. While most of Mittal's wealth comes from his steel empire, though he has also spread his wings into businesses like oil and real estate, those of Ambani and Gates are mostly through petrochemicals and software respectively. However, Buffett and Slim are making money from investments across a host of sectors. Not much of a difference between 1 and 2. Sure to change next month.